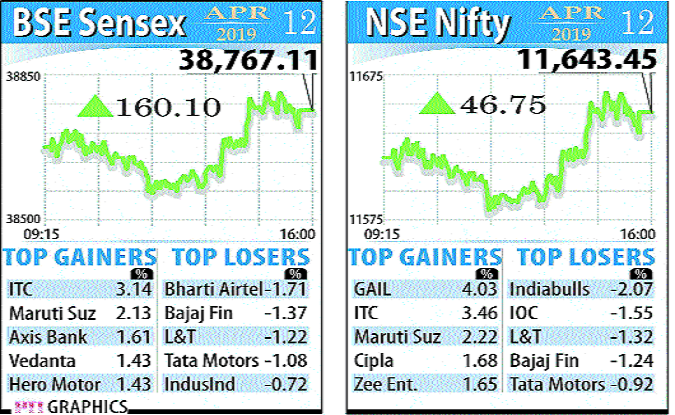 EQUITY benchmarks closed in the green for the second straight session on Friday as investors looked forward to the earnings season with measured optimism amid an uncertain global growth environment. After rising over 200 points intra-day, the 30-share BSE Sensex finally settled 160.10 points, or 0.41 per cent, higher at 38,767.11, led by FMCG, auto and banking stocks. The broader NSE Nifty rose 46.75 points, or 0.40 per cent, to 11,643.45. During the week, the Sensex fell 95.12 points or 0.24 per cent, while the Nifty shed 22.5 points or 0.19 per cent. “General elections and upcoming Q4FY19 numbers will remain the crucial triggers for the market in the short term. On the earnings front, we expect that a low base effect, turnaround in profitability of corporate lending banks and healthy growth in earnings of energy companies are expected to largely drive aggregate Sensex earnings,” said Hemang Jani, Head - Advisory, Sharekhan by BNP Paribas. ITC was the biggest gainer in the Sensex pack, rallying 3.14 per cent. Maruti Suzuki, Axis Bank, Hero MotoCorp, Vedanta, Asian Paints, M&M, HUL, Bajaj Auto and PowerGrid were among the other top gainers, rising up to 2.13 per cent. On the other hand, Bharti Airtel, Bajaj Finance, L&T, Tata Motors, IndusInd Bank, Tata Steel, HCL Tech and ONGC were among the top laggards, shedding up to 1.71 per cent. IT bellwether Infosys ended 0.63 per cent higher, while rival TCS slipped 0.26 per cent ahead of their quarterly earnings. Sectorally, BSE FMCG index gained the most, spurting 1.71 per cent, followed by utilities, power, auto and banking, rising up to 1.12 per cent. Broader indices rose in line with the benchmarks. The BSE Midcap index gained 0.29 per cent, while the small-cap gauge ended 0.37 per cent higher. Meanwhile, foreign institutional investors (FIIs) net bought shares worth Rs 476.51 crore on Thursday, while domestic institutional investors (DIIs) sold equities to the tune of Rs 16.58 crore, provisional data available with stock exchanges showed. Global markets were mixed amid global growth concerns, which were partially offset by positive China exports data.